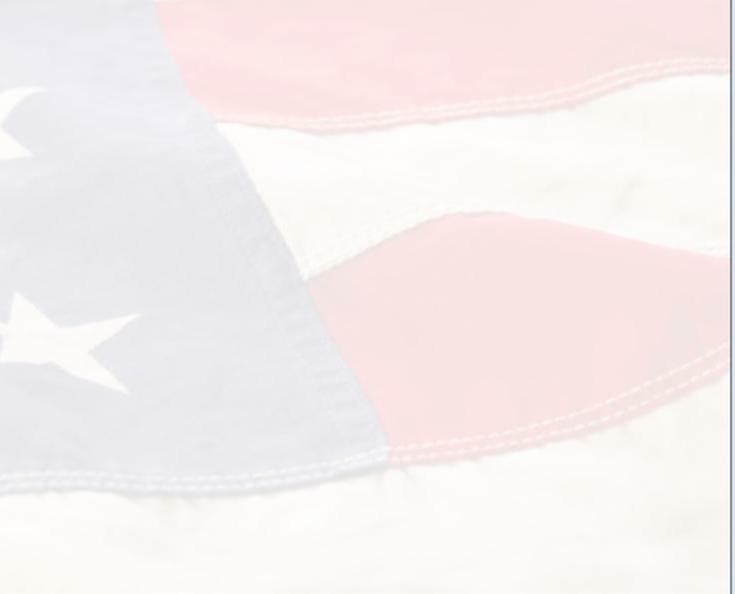 Please consider a Donation to support our work! Thank you! 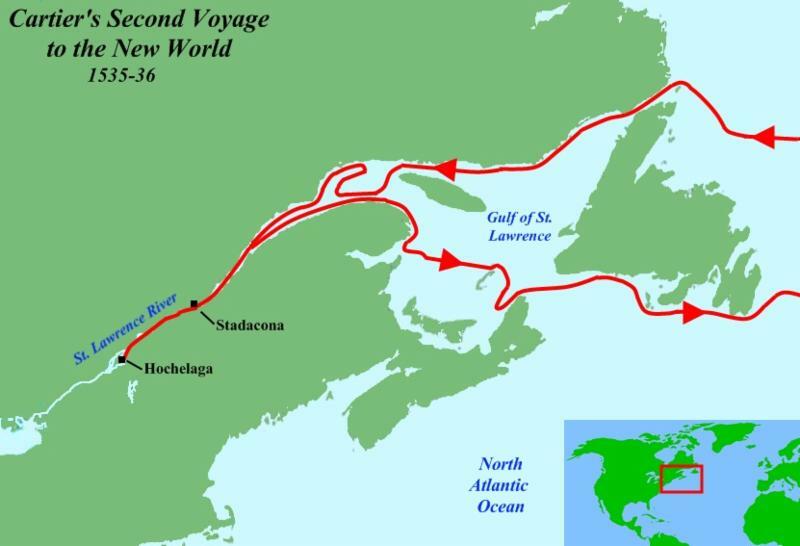 In 1535, Francis I, the King of France, sent explorer Jacques Cartier to find a "northwest passage" to China, but he only got as far as the impassable rapids on the Saint Lawrence River , which named La Chine, because he though China was just on the other side. 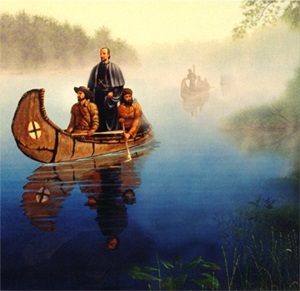 Cartier also named the land "Canada," which was the Iroquois name for two settlements on the river: Stadacona (Quebec City) and Hochelaga (Montreal Island). 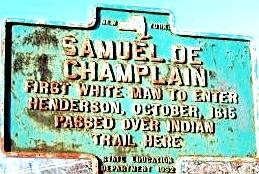 France began seriously colonizing Canada 70 years later, during the reign of Good King Henry IV, who sent over Samuel de Champlain. 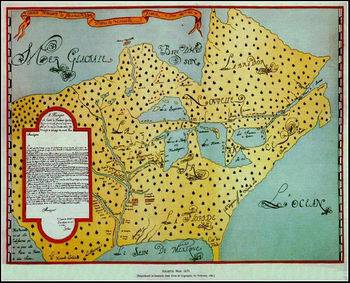 Champlain founded Quebec City in 1608. 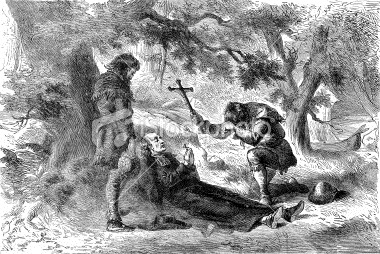 When King Henry was assassinated in 1610, his son, Louis XIII and his Chief Minister Cardinal Richelieu, continued sending Champlain to explore and colonize Canada. 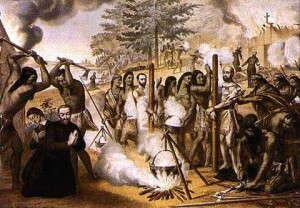 French Catholic missionaries sought to peacefully reach natives, though many suffered the fate of martyrs in the process. 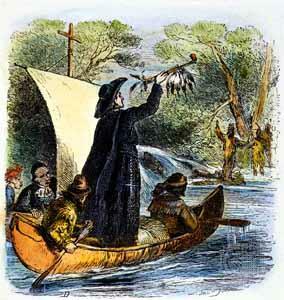 One French missionary was Isaac Jogues, who taken prisoner by the Iroquois in 1641. 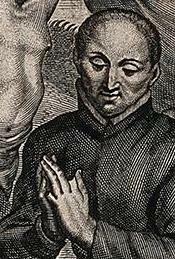 Indians gnawed off two of his fingers and roughly sawed off his thumb. 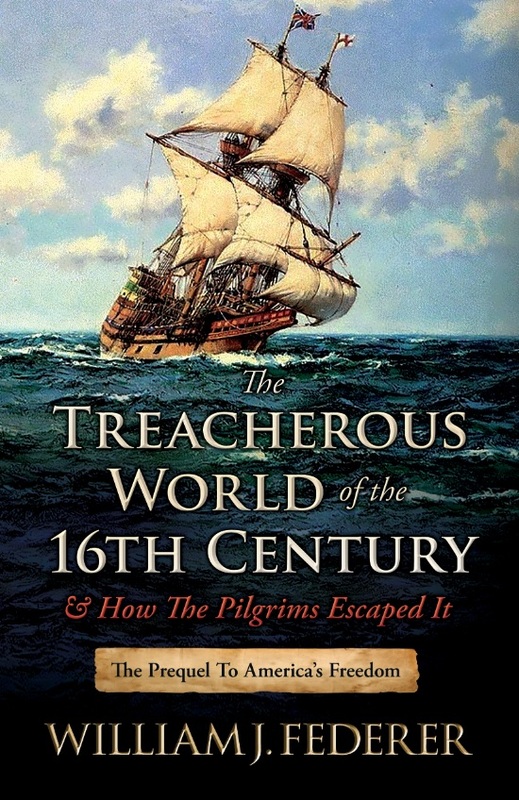 He was forced to run the deadly gauntlet, as described in The Jesuit Martyrs of North America, but was able to barely escape. 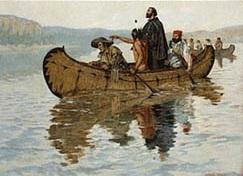 He escaped and with the help of Dutch traders and made his way back to Quebec and then France. 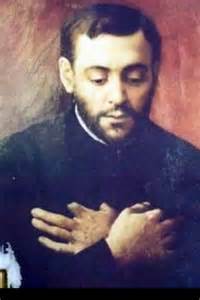 Isaac Jogues later returned to America to continue his missionary work till he was killed. 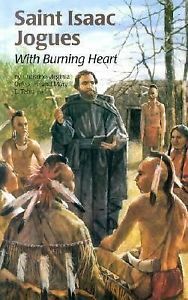 -John de Brebeuf, who wrote to newly arrived missionaries: "You must love these Huron, ransomed by the blood of the Son of God, as brothers." 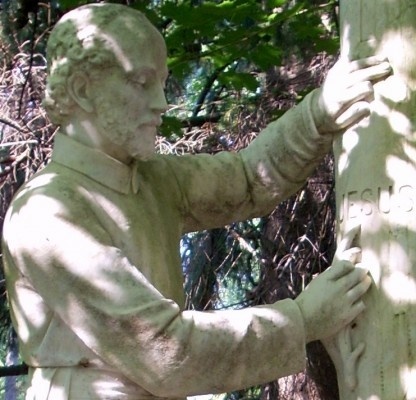 Courageous missionary stories such as these inspired Père Jacques Marquette, ("Père" is French for "Father"), who arrived in Quebec from France to be a missionary among the Indians. 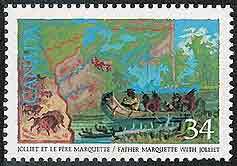 In 1673, Frontenac, the Governor General of New France, commissioned Père Marquette to explore the unknown Mississippi River. 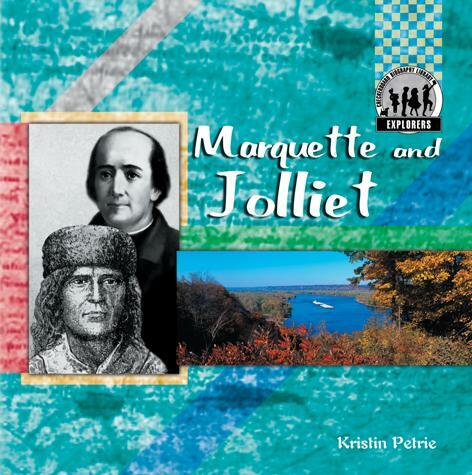 Marquette traveled with French explorer Louis Joliette by canoe along the west coast of Lake Michigan. 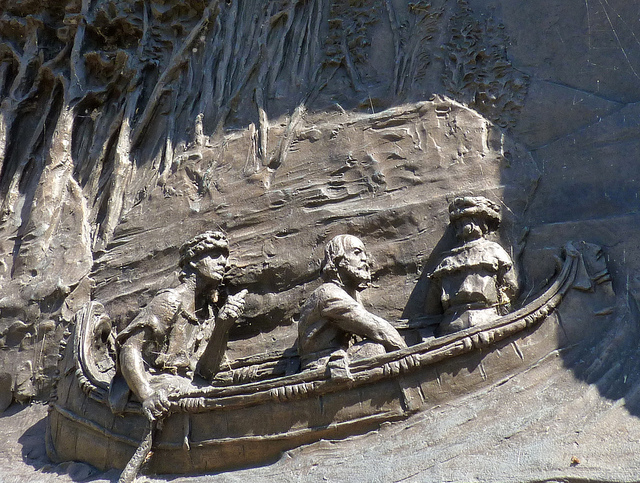 They canoed to Green Bay, up the lower Fox River, across Lake Winnebago, and up the upper Fox River. 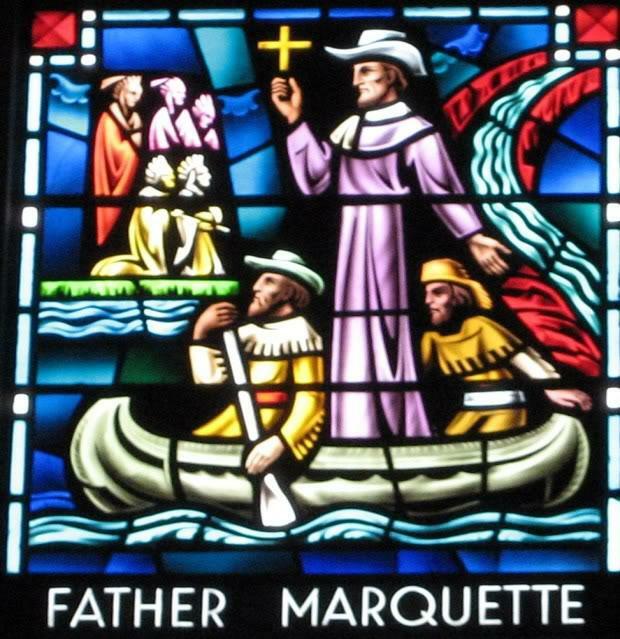 Marquette and Joliette then portaged their canoes two miles through marsh to the Wisconsin River, where their two Indian guides abandoned them, fearing "river monsters." 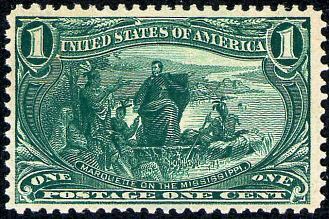 Marquette and Joliet canoed the Wisconsin River to the Mississippi River, where they traveled south to just below the Arkansas River, hesitating to go further for fear of entering Spanish Territory. 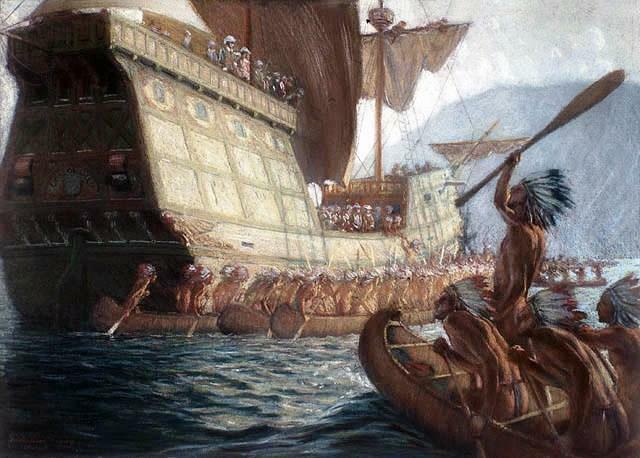 "We came to ... the Folle Avoine (Menominee). I entered their river to go and visit these people to whom we preached the Gospel ... in consequence of which, there are several good Christians among them. ... 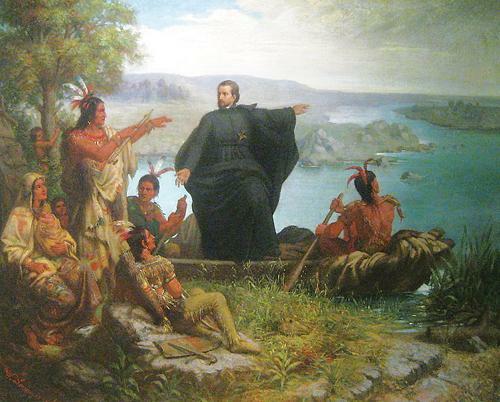 I told ... of my design to ... discover those remote nations, in order to teach them the mysteries of our holy religion. ... 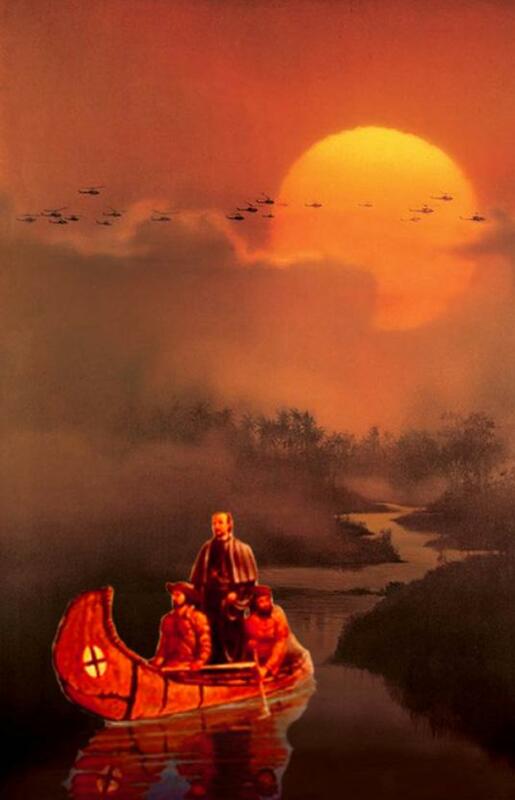 They also said that the great river was very dangerous ... full of horrible monsters, which devoured men and canoes together; that there was even a demon, who ... swallowed up all who ventured to approach him ..."
... After making them pray to God, and giving them some instructions, I separated from them." 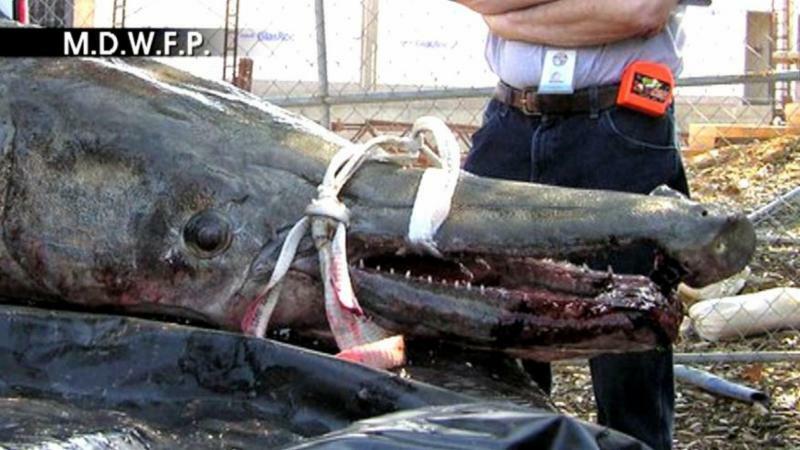 Very large fish could have existed in the Mississippi River as it had never in history been commercially fished up to that point. 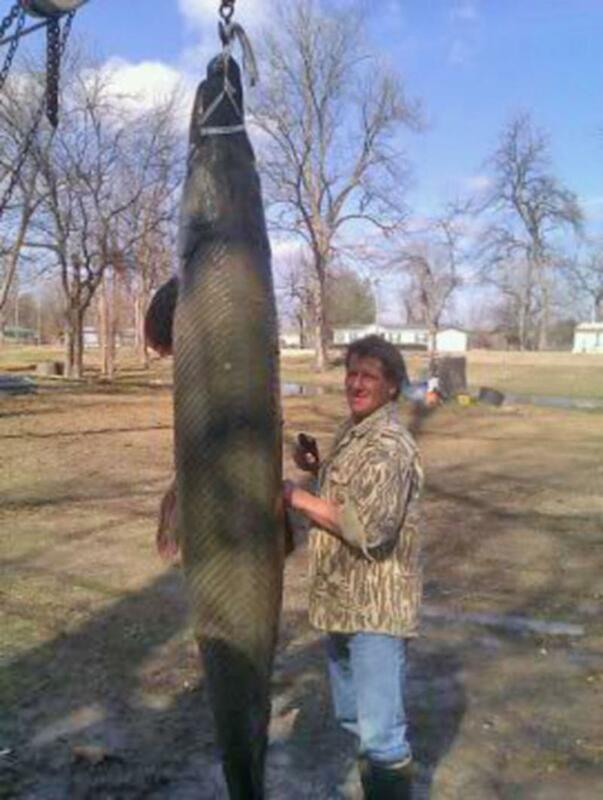 "Officials with the Mississippi Department of Wildlife, Fisheries and Parks (MDWFP) said it could be the largest alligator gar caught." "Here we are at Maskoutens. This word may, in Algonquin, mean 'the Fire Nation' -- which, indeed, is the name given to this tribe. and he told them that he was sent by Monsieur our Governor to discover new countries, while I was sent by God to illumine them with the light of the holy Gospel. ... He told them that, moreover, the Sovereign Master of our lives wished to be known by all the nations; and that in obeying His will I feared not the death to which I exposed myself in voyages so perilous. He informed them that we needed two guides to show us the way; and we gave them a present, by it asking them to grant us the guides. 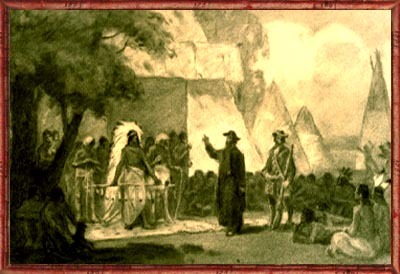 To this they very civilly consented; and they also spoke to us by means of a present, consisting of a mat to serve us as a bed during our whole voyage ..."
"On the 25th day of June we perceived on the water's edge some tracks of men, and a narrow and somewhat beaten path leading to a fine prairie. We stopped to examine it; and, thinking that it was a road which led to some village of savages, we resolved to go and reconnoiter it. 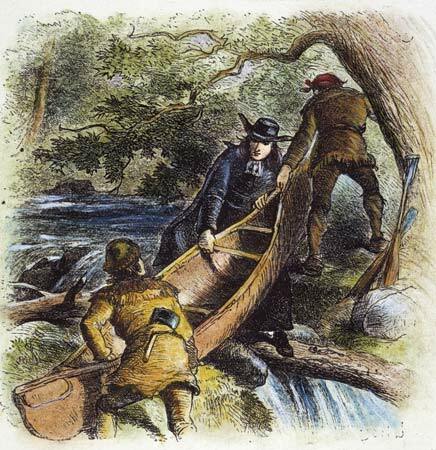 ... We therefore left our two canoes under the guard of our people, strictly charging them not to allow themselves to be surprised, after which Monsieur Joliet and I undertook this investigation -- a rather hazardous one for two men who exposed themselves alone to the mercy of a barbarous and unknown people. We silently followed the narrow path, and, after walking about two leagues, we discovered a village on the bank of the river, and two others on a hill distant about half a league from the first. ... Then we heartily commended ourselves to God, and, after imploring His aid, we went farther without being perceived, and approached so near that we could even hear the savages talking. We therefore decided that it was time to reveal ourselves. This we did by shouting with all our energy, and stopped without advancing any farther. 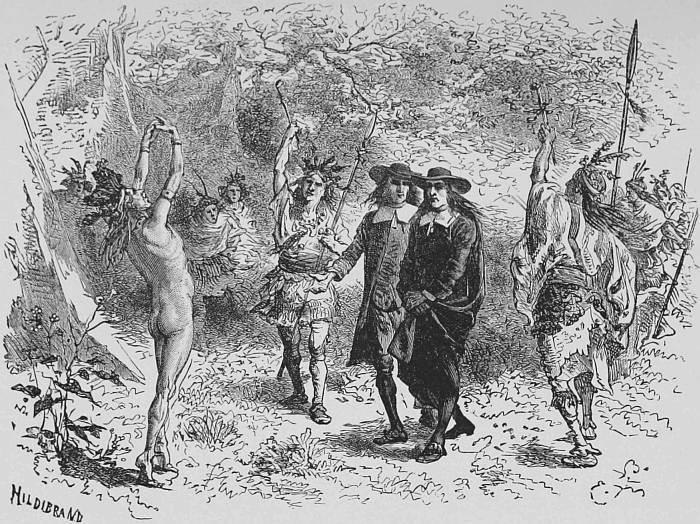 On hearing the shout, the savages quickly issued from their cabins, and having probably recognized us as Frenchmen, especially when they saw a black gown -- or, at least, having no cause for distrust, as we were only two men, and had given them notice of our arrival -- they deputed four old men to come and speak to us. ... Two of these bore tobacco pipes, finely ornamented and adorned with various feathers. They walked slowly, and raised their pipes toward the sun, seemingly offering them to it to smoke--without, however, saying a word. They spent a rather long time in covering the short distance between their village and us. ... Finally, when they had drawn near, they stopped to consider us attentively. 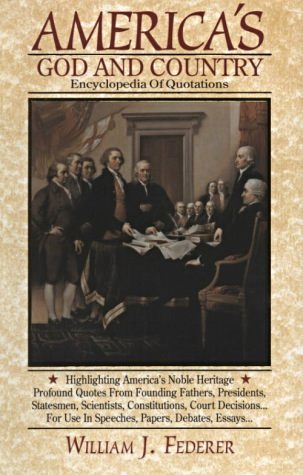 I was reassured when I observed these ceremonies, which with them are performed only among friends; and much more so when I saw them clad in cloth, for I judged thereby that they were our allies. I therefore spoke to them first, and asked who they were. They replied that they were Illinois; and, as a token of peace, they offered us their pipes to smoke. ﻿They afterward invited us to enter their village, where all the people impatiently awaited us." 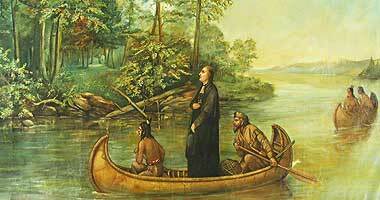 On their return trip up the Illinois River, Jacques Marquette founded a mission among the Illinois Indians. 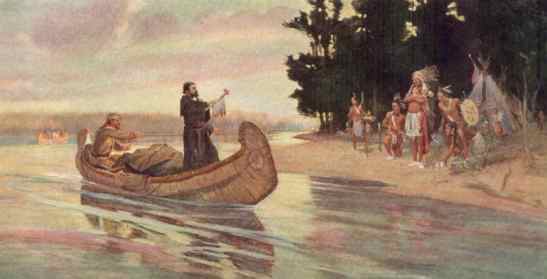 The next year, caught by a winter storm, Jacques Marquette and two companions erected a rough log cabin near the shore of Lake Michigan. 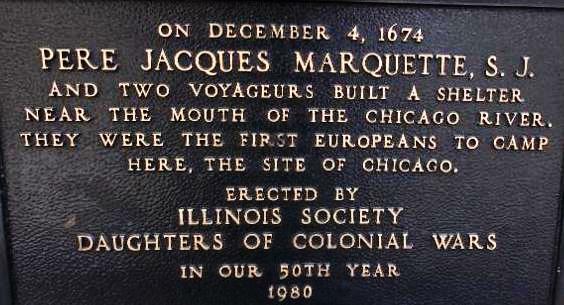 "On DECEMBER 4, 1674, Père Jacques Marquette, S.J., and two voyageurs built a shelter near the mouth of the Chicago River. 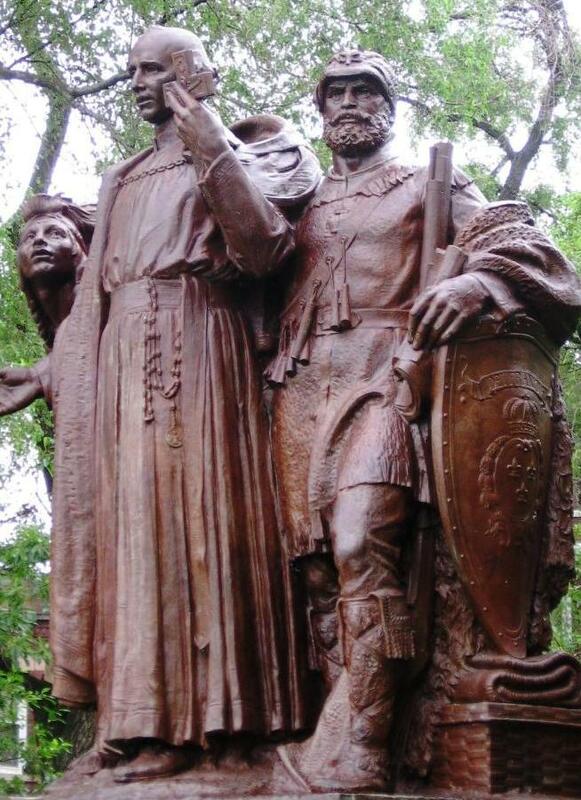 They were the first Europeans to camp here, the site of Chicago." and especially he preached to them Christ crucified, for it was the very eve of the great day on which he died on the cross for them." 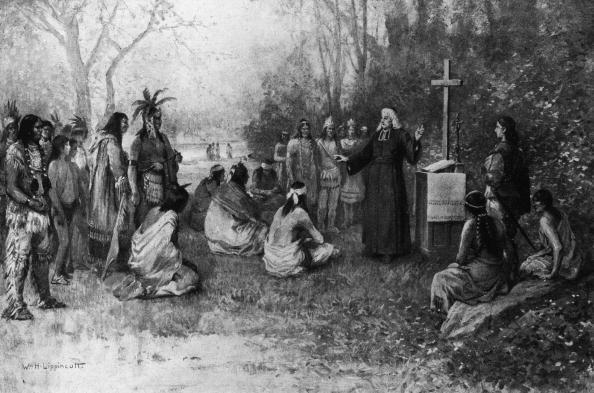 On May 18, 1675, being weakened by dysentery, Père Jacques Marquette died at the age of 37. 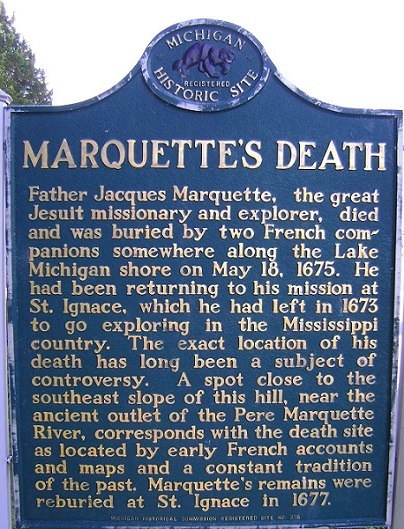 Marquette had founded Sault Ste. 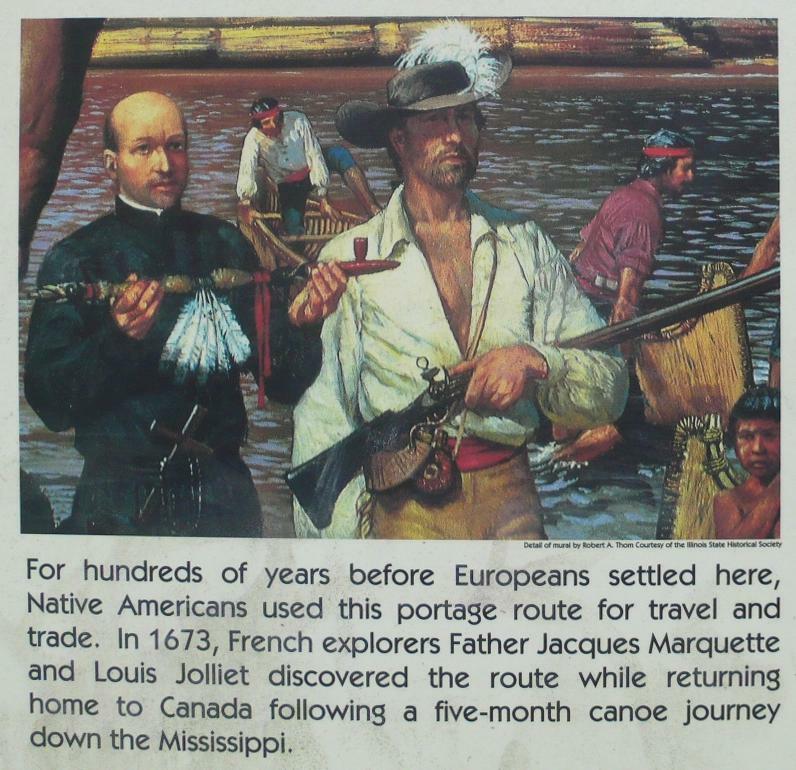 Marie, the first European settlement in Michigan, and the town of St. Ignace. and Marquette University in Milwaukee, Wisconsin. 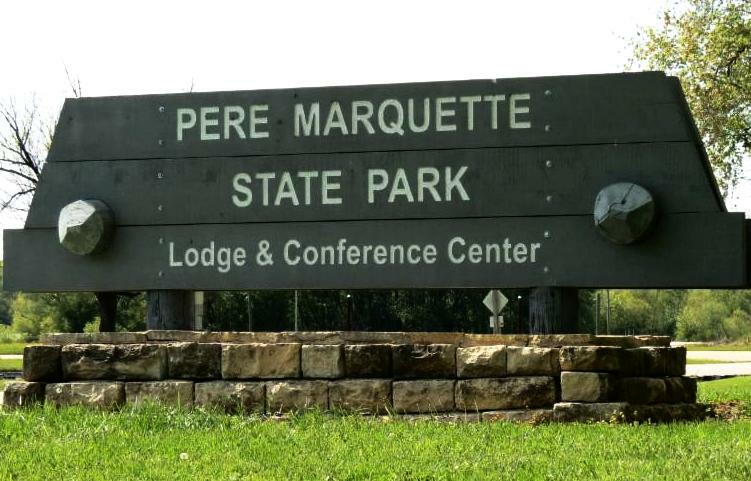 Père Marquette State Park near Grafton, IL, oversees the Illinois River close to where in joins the Mississippi River. 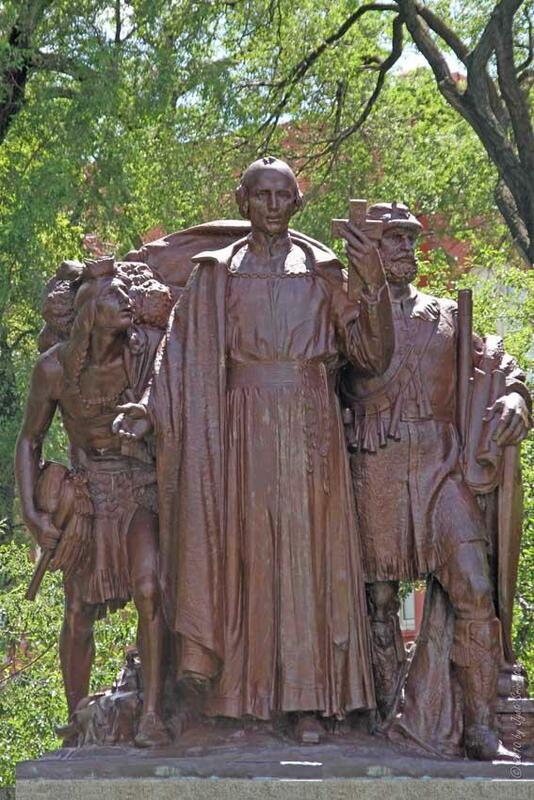 In 1895, the State of Wisconsin placed a statue of Père Jacques Marquette in the U.S. Capitol Statuary Hall. 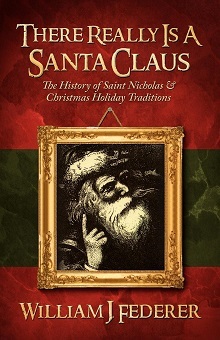 Learn the History of Holiday Traditions!